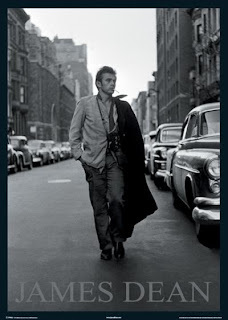 Male style icons are, in my opinion, more unique personalities than fantastically dressed people. Their clothes, ideas, and acting combine to form a non-fashion related style. 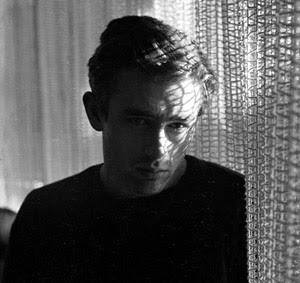 James Dean is an awesome example of this. 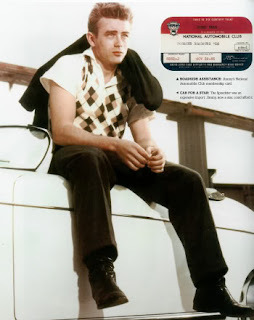 Few people are as hung up with dressing like him as they are with acting like him--but a closer look reveals that his clothes matched the attitude that made him so popular. What attitude exactly? A rebellious, modern, and vaguely dangerous one. 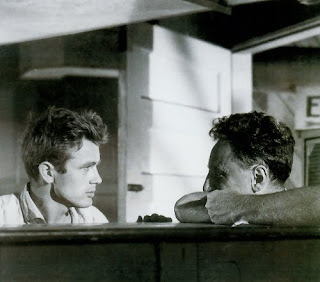 Perhaps James Dean encouraged 1950s teenagers to be borderline delinquents, but he only had this effect because that is what they already were, and by being the same way, he validated their position and painted it as a legitimate way to be. He was a total glorified bad boy, but he always seemed to mean well. A sympathetic rebel, and that is how all rebels feel about themselves. No wonder he made such a hit with teenagers and still resonates today. 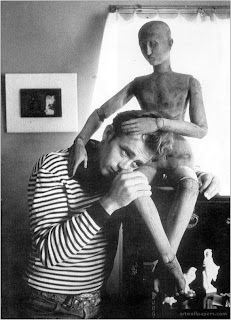 My real purpose is not to analyze the causes and effects of the James Dean phenomenon but to talk about his clothes and his image. Certainly you couldn't have expected a scholarly, unfrivolous post from this me. In the future, you should know better. Anyway, the easiest way to get my point across would be to do a pic spam, but that isn't at all sufficient or in-depth, so I shall try to write a paragraph for each picture and point out some things you might not have noticed, if I notice them myself (not likely). If you like this, please tell me, because if I get the feeling no one cares for this format, I won't do it very often. "It takes 500 small details to add up to one favorable impression." Here we see a lot of the elements that were part of Jimmy's persona. This picture was taken in some sort of art room or gallery and he is posing similarly to the statue on the table behind him, representative of his artistic side. It is also a very modern photo--it practically could have been taken yesterday--and the colors of Jimmy's clothes are an essential part of this. The combination of cool dark blue and white is very sleek, colors which also happen to be brought out by the color of the statue, the table, and the hazy background. If you have seen modern movies that take place in the past, something that keeps them from looking completely authentic is the tint of the film, which is often blue or gray in today's movies, but was yellowish seventy years ago. The blue tint here lends a very modern touch. 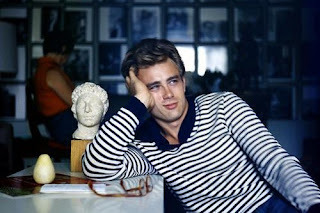 Here I see a distinct Brando resemblance around the mouth, but that is beside the point. Instead, notice the minimalist combination of brown and white, the leather rather than metal watch band, the lack of a tie, and the hair. The extremely messy polar opposite of your typical boy next door's hair. There is nothing precise or polished about this image. However, it has a similar quality as Grace Kelly's snow-covered volcano persona. Jimmy may be wearing a suit, but beneath it he is his sensual, untamed self. The same contradiction is present here. Jimmy is wearing a suit in the same sleek brown and white, but the jacket's off and he's sitting on a hot car (hot in no small part because he's on it) with his hair messed up as usual. In so many pictures, the background color seems selected to set off the modern, clean colors of his clothing--in this picture, that is done by the cream car and the brown thing sticking up in the back. Also see the lace up boots, which add a rugged touch to the outfit. This picture is hard to see, but it does show a few things. As elegant a shot as it may be, the modern coloring is all that saves Jimmy from looking like a near tramp. That and the fact that the clothes he is wearing are actually very nice...just wrinkled and very casually put together. See the clean line of the black t-shirt, the contrast caused by the sunlight streaming through the odd curtains, the moody look, the unshaven face (you see that SO often now), and the messy eyebrows. 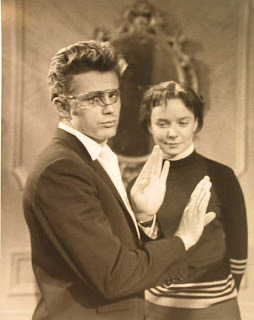 He looks properly untouched up--but considering how different most men in the fifties were styled up for photos, this was probably a more offbeat shot. Have you ever seen Cary Grant this way? I haven't even seen Marlon Brando like this. 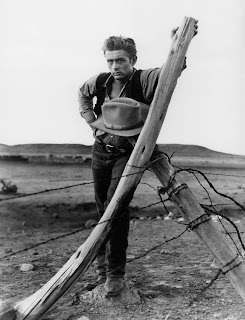 I can't think of anybody famous before James Dean who posed so naturally--and by natural I mean without the dressings and stiffness of a typical movie star. Great post! I, too, shamelessly indulge in picspams - and love every minute of it! Wow, I really just think this post was great! I think that James was/is such a style icon. My oldest brother's style is almost scarily similar (and he's not even familiar with James). BTW, that first photo is amazing. I had never seen it before! Hahaha, and I was kinda laughing out loud at the photo of him on the car...reminds me of Miss Vintage...hahaha! Totally enjoyed it. You made some great points and insights! PS: I am LOVING the new blog header! I hope to be back here soon; I have missed you quite terribly, if that doesn't sound too creepy hee hee. I had a fascination with him during teens, mine, not his. I would add a fifth element, the off-kilter, there is something of an invidivual about him, someone on a tightrope.